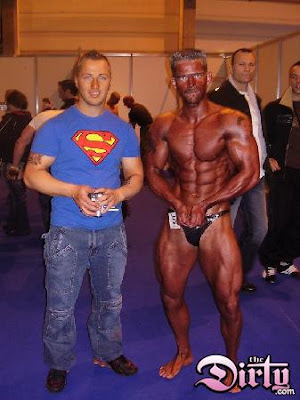 Besides the rampant steroid use, tanning is one of the things I dislike about one of my favorite hobbies: bodybuilding. The third and fourth pics aren't actually that bad since they are right before a competition. They just show how bizarre the whole bodybuilding fake tan is out of context. The face of the guy in the 5th pic doesn't look too awful, but the glasses really makes things look weird. Obviously the guy is vain since he's competing in a bodybuilding contest, so get LASIK or get some contacts brOdysseus. Thanks to theDirty.com and failblog.org for some of the pics. Is that Nick Hogan on the left in the 2nd photo? I hate fake tan... BUT bodybuilders wear it so the definition of their muscles is more visible when competing. I know it looks stupid, but thought I would let you all know why they do it. A roll of the dice came up "Ace Deuche"
Don't worry, this is a dude.